Dog Crate Sizes – What Do I Need? There comes a time when many dog owners are faced with a decision of whether or not to crate their furry friends. 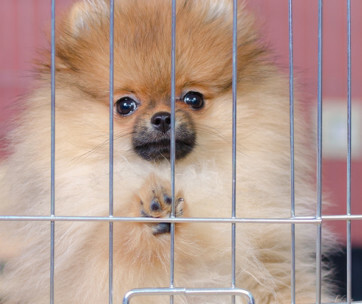 Although it may seem cruel at first, having a dog crate can be beneficial to both the dog and its owner. With a crate, a dog benefits with having its very own personal retreating place, while the owner has a degree of control over the dog’s safety and training. For this reason, choosing the right crate size is vital if you want a successful crate training. A crate that is of the wrong size may lead to some discomfort for your dog who may start to feel some aversion to crate training. For example, when you choose a crate that is of a small size to your dog’s frame, it will restrict the dog’s movement making them feel uncomfortable. The same problem applies when you use a large cage for your dog as they may become disoriented. This article will be focusing not only on the importance of having the right dog crate size but also on why you need a dog crate, how to choose the right dog crate, how to measure a dog for the right dog crate and what to consider when choosing a dog crate. The Benefits of Having a Dog Crate? A good way to teach your dog some form of routine is by using a crate. 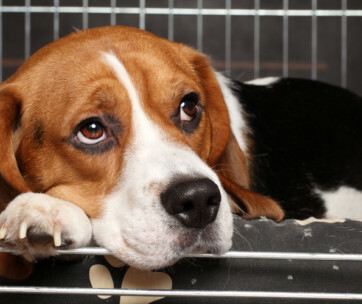 Your dog becomes used to confinement and it helps you control most of its activities. Housing your dog in a crate makes traveling easier for you, as you can feel relaxed knowing that your dog is being transported in a safe and familiar environment. Though you may want to limit your dog’s movement, you may not want to totally exclude it from your activities. A dog crate allows your dog to be with you without interfering. These crates are more suitable for dogs with long coats. These are commonly used for travel but they are also fit for more permanent and daily use. This is perfect for those after a sturdy crate. These are perfect for those who travel often as they can easily be folded. To determine the right crate size for your dog, it is important to get the correct measurements for your dog both in terms of length and height. To get the correct length for a dog crate, measure from the tip of the nose to the base of the tail. Then add between 2 and 4 inches to the initial measurement which will give you a perfect length for the crate giving your dog enough space to move around. To get the correct height for a dog crate, make sure your dog is sitting upright, then start your measurement from the floor to the tallest point of their head. Then add between 2 and 4 inches to the initial measurement. Crates come in different sizes. Listed below are the dog crate sizes with the breed of dog they are suited for. These dog crates are designed for smaller dogs that have a weight ranging from 1 – 10lbs and height ranging from 6” – 10”. These include Affenpinscher, Bichon Frise, Pug, Chihuahua, Papillon, Boston Terrier, Miniature Dachshund, Jack Russell Terrier and Shih Tzu. This next crate size is specially created for dogs that have a weight ranging from 11 – 25 lbs and height ranging from 19” – 22”. Amongst others, this includes the Pekingese, Jack Russell, Skye Terrier, Tibetan Spaniel, French Bulldog, Scottish Terrier, Cocker Spaniel, and American Pit-bull Terrier. Medium dog crates are the favourite for dogs that weigh between 28 lbs and 40 lbs and measures height of 20”-24”. Amongst others, this includes Basenji, King Charles spaniel, Miniature Schnauzer, Shetland sheepdog, Welsh Terrier, French Bulldog, Lhasa Apso, Staffordshire Bull Terrier, American Water Spaniel and Cardigan Welsh Corgi. The large size crate is well suited for dogs that are up to 70 lbs in weight and 26”-28” in length. This includes the Belgian Sheepdog, Bull Terrier, English Setter, Finnish Spitz, Portuguese Water Dog and Whippet. These are cages that are well suited for dogs weighing between 71-90 lbs and height between 30” to 31”. This includes the German Shepherd, Labrador Retriever, Airedale Terrier, Bearded Collie, Irish Setter, Irish Water Spaniel, Boxer, Chow-Chow, Golden Retriever, Doberman Pinscher and Dalmatian. This type of dog crate caters for dogs that weigh from 90 lbs to 150 lbs and has height ranging between 31” to 40”, This includes the Afghan, Bloodhound, Bull mastiff, Great Dane, Rottweiler, Greyhound, Old English sheepdog, St. Bernard, Irish Wolfhound and Borzoi. The main reason you have for getting a dog crate should influence the type you eventually buy. If you have a travel plan with your dog, it is advisable to get a dog crate that is easily foldable and requires little storage space. Also, if you wish to keep your dog outdoors, buying a crate that can withstand varying weather conditions would be better. 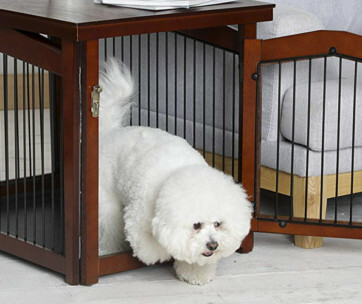 Likewise, if your dog is to be kept indoors, wooden dog crates are the best fit as they can easily fit into the décor of the home. It is important to consider your storage space before purchasing a dog crate. For little or no space, buying a soft-sided or wire crate is advisable as it is easy to fold. On the other hand, plastic dog crates are harder to fold and will require a larger storage space. It is advisable to purchase sturdy dog crates like the plastic ones as they can withstand exposure to weather elements. For dogs that suffer from separation anxiety or who have a destructive nature or chewing habit, buying soft sided crates are not suitable as it can easily get damaged. Dog crates usually have single, double or triple doors and they have varying benefits. For example, when you have extra small dogs, it is useful to have multiple door openings to have unlimited access to them. It is useful to purchase dog crates according to the amount of time your dog will spend in them. If you want to leave your dog for a large period of time, you can use a plastic or wooden dog crate. On the other hand, using soft-sided crates are suitable if your dog will be confined for little time.